Coleman Randolph Hawkins (November 21, 1904 – May 19, 1969) was an American jazz tenor saxophonist. Hawkins was the first important jazz musician to use the instrument. As Joachim E. Berendt explained, "there were some tenor players before him, but the instrument was not an acknowledged jazz horn". While Hawkins is most strongly associated with the swing music and big band era, he had a role in the development of bebop in the 1940s. 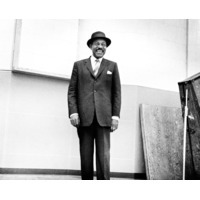 Lester Young, who was called "Pres", in a 1959 interview with The Jazz Review, said "As far as I'm concerned, I think Coleman Hawkins was the President first, right? As far as myself, I think I'm the second one." Miles Davis once said: "When I heard Hawk I learned to play ballads." Hawkins was nicknamed "Hawk" and sometimes "Bean".